Five years ago, my buddy James brought a bottle of Caol Ila to the inaugural Anderson Business School Whisky Club meeting, held at our old Hollywood apartment. It was my first Caol Ila (G&M bottling, BevMo exclusive) and one of my first positive peaty experiences. Kristen remembers it as if it'd happened yesterday. Not so much smoke on the nose and palate but once the drinker exhaled, the finish filled one's head with campfire smoke. It was dense and lovely. It could make a drunk feel like a dragon (though, I'm sure a cigarette and mezcal would do the same thing). Sometimes I wonder if that was the last time my wife drank a peated whisky for fun. Nowadays, when I hand her a glass of something only slightly peated she says, "Smells like smoke," and passes it back to me. Overhand. Anyway, that was a good start for Caol Ila and I. On Monday, I posted a report on the officially bottled 12 year old. On Tuesday, it was a post on the official 18 year old. Today, it's the 2012 limited release of a cask strength 14 year old, that was unpeated. Yep, unpeated. In the 1980s, the distillery started experimenting with unpeated malt runs and continued to do so off and on until 2005 when the market's demands for peated malt ended these trials. In 2006, they started an annual limited edition bottling of the unpeated Caol Ila. The positive response has kept the releases going ever since. In most of the reviews of the early bottlings, you'll see that folks tend to still find peat notes in the "unpeated" whisky. One explanation is that while the malt itself was unpeated, phenolic residue that wasn't scrubbed off the stills wound up transferring itself back to the spirit being run through. Another possibility I've been wondering about comes from the label on all of the bottlings (see above), which reads with quotes "Unpeated Style". Those quotes and the addition of the word style makes one ponder the possibility that perhaps the malt was peated at much lower level, 3-5ppm for instance. I'll tell you ahead of time, I didn't find any peat from my sample of the 2012, but I can definitely see why some folks refer to these releases as Caol Ila Highland. The color is gold, just a smidgen darker than the 18. Lots of ethyl burns one's nose as the whisky announces its high ABV. Interesting that this comes from European oak because I get tons of vanilla from it, but more on that in a sec. The other main notes are swimming pool chlorine, cocoa powder, butterscotch, and roses. But there's also an intense vanilla and brown sugar combo that smelled strikingly like Johnnie Walker Black Label. Then there's Nilla Wafers, which I usually find in Canadian blends. Then (to confuse you further) the floral note combined with a lot of coconut cream hits, reminding me of high strength single grain whisky. The palate was more straightforward: digestive biscuits, charred wood, brown sugar, sea salt, and a brief savory note. It's a bit hot and toasty, but simple. Lots of malt arrives in the lengthy finish, followed by salt and toasted wheat bread. Again, focused like the palate. The nose starts with swimming pools filled with caramel and roses. Salted caramel ice cream with Cool Whip on top. The palate is now reminiscent of a toasty malty blend. All sugar and spice, maybe some nutmeg and vanilla bean. Reminds me of Compass Box's Great King Street Artist's Blend. It finishes mildly with salt and malt. I apologize for all of the comparisons in my notes, but the whisky continually reminded me of other whiskies. Which was kind of weird. I also found very little of the classic European oak notes, other than maybe the toast and spice. Adding water made it a better drinker but also did not make it stand out in any way. 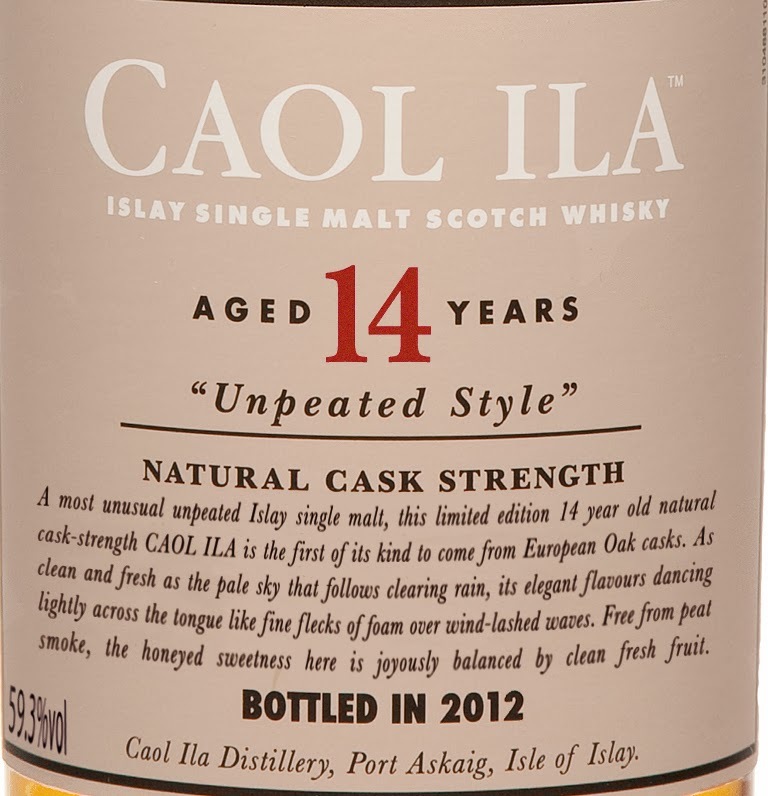 No actual criticisms come to mind, other than this version of the "Unpeated Style" of Caol Ila seems interchangeable with a number of inoffensive single malts and high malt blends. Its benefit is its high strength which allows for the expression of the full power of the malt and also allows for toying around with water. With and without water, I tried it alongside the regular 12 year old and always preferred the peated version. It could be a case of my nose and palate preferring the phenolics, but I did find the peat bringing more depth and variety to the experience. As for other opinions, Serge liked this unpeated version slightly better than I, though he found lots of vanilla and not much sherry as well. If you can find it in the $75-$85 range, then it'll be what currently passes for a good deal on a cask strength bottling at its age. I do recommend trying it first, just to make sure your expectations are in the right place. For me, I'll stick with the bacon, barbecue, and campfires of the peated version. I have the 2011 edition which is 12 years old but I haven't opened the bottle yet. I can tell you that whisky was matured in American oak so the 2011 might be closer to the standard Caol Ila in style minus the peat. Yeah, I think this was possibly the first one they did in ex-sherry. When/If you open it, I'd be curious to know if you find any peat in it. Talk about the changing demand for whisky. The 2011 edition stayed on shelves for over a year in one Bay Area store but the 2012 and 2013 editions are nowhere to be found. I've heard the term "allocated" a lot lately which tells me other stores probably grabbed the rest of the bottles destined for the US. Speaking of Diageo, any thoughts on Mortlach finally making it's way here as an official bottling? Ian Buxton's report on the Mortlach release says that he's under the understanding "that the ‘new’ Mortlach will be positioned as a luxury brand, with the entry level Rare Old priced alongside Johnnie Walker Platinum". That would mean the NAS would be in the $90-$100 range. If that does turn out to be the case, then it's just plain silly. They'll essentially be positioning Mortlach at premium brand pricing far above a number of superior Classic Malts, thus basically saying, "This is a luxury item because we say it is, not because of quality or rarity." But if they price it at levels parallel to the rest of Classic Malts, I guess it'll be nice to have more single malts available here. Since I'm pretty neutral on my personal opinion of Mortlach's quality, and because of my feelings about Diageo in general, it's difficult for me to get too excited about the whisky itself. For Mortlach fans, this could be good. For indie bottlers, it's one more distillery they'll have trouble sourcing from, if Diageo hadn't already cut off the supply. The one I had at the distillery was ex-American oak and mostly tasted like high-proof, slightly more delicate bourbon. Interesting and tasty, but not enough to make me want a whole bottle. Yeah, that's my feeling about this version of it. It's good but it doesn't establish itself as anything one can't elsewhere for less money and less of a search. The 12 yo "Unpeated" released in 2010 is pretty palpably peated (try saying that three times fast!). The 10 yo released in 2009 is not. I've reviewed both (if you want to look at the details of what I found) and liked them both a lot. The "unpeated" 12yo sounds nice especially since this 14yo could have used a little something else, like peat or quality oak, to spice it up. Or some of the coastal notes from the 10yo would have worked well too. Or it's always possible my nose missed those things entirely. If you get a chance to sample this one, I'd be curious to know what you think of it. 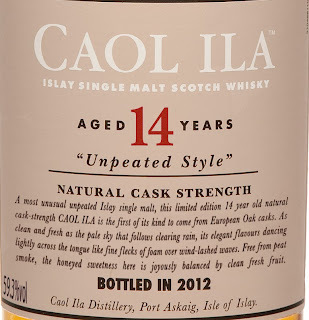 Between the reviews of the two of you I asked Santa for a Caol Ila 12yo Unpeated, 2010. I'll leave some for him in a glass. What a nice Santa. I'd agree with you on the 12yo. Even though I haven't had it yet, a little bit of peat would definitely help out matters. I'm tasting the 1997/2010 bottling (57.6%) version and it's da bom! Thaaank youuu, Santa! I just wish I could put it in words - sweet peat, pickled lemons, olive brine, sea weed, sea salt, sure, but there's something more that I just can't pin down, ineffably Islay and Caol Ila. Where is this sweetness coming from? Is it just a bit of ex-sherry whisky? Or is it from sweet ex-George Dickel barrels? It's so perfectly rounded, the sweetpeatpickle telling one single story, nose and palate. If this is a master distiller's trick then hats off to him (her?) Same amazing balance as in the OB 12yo only in guitar solo version. This is becoming a top 3 distillery for me. Now if you'll excuse me, I have to go drink and cry. **** or better whisky. Wow, Santa was very generous! I find it funny that there's clearly some peat in most of their Unpeated range. Until we track down some Caol Ila new make, I'm thinking they're getting the best of the former Dickel barrels. For some reason I thought I had the 2011 edition since I bought the bottle in 2011 so imagine my surprise when I finally noticed the 2010 date on the label when I opened the bottle. While the peat is definitely there, I think this is the best way to taste Caol Ila's intrinsic character. That's cool. I think I have a sample of that 2010 edition somewhere around here (in fact it might be from the bottle Florin references above). Looking forward to it. I'll try to put it in a Caol Ila verticale if I can. I wish I picked up a bottle of the 2011 to compare. The 2010 seems to be the one everyone (even Ralfy) likes so it's odd to not see too many reviews of the 2011.